Backpacking adventures will find you in all sorts of situations and locations – from Sprawling deserts to Thick jungles. From Blue oceans to Bustling cities. It is also inevitable that you’ll want to capture all your experiences and not just “Stills” but also Videos; Action videos in case of Surfing, Scuba Diving, Cycling etc. So, for this you can’t just rely on your normal camera, you are in quite need of a dedicated Action Cam (Travel Gear) for these very purposes. 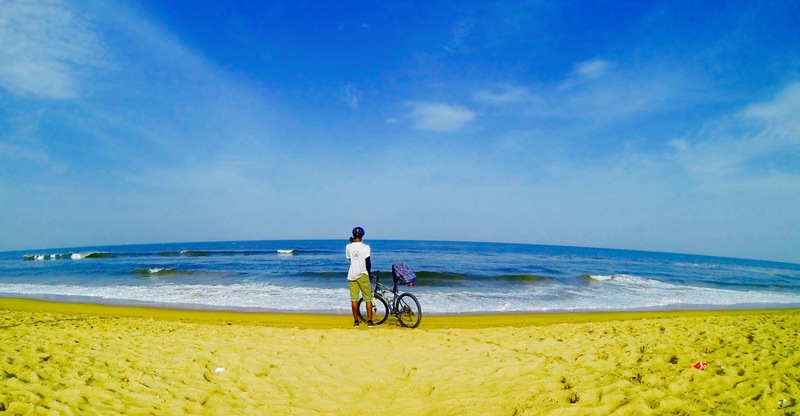 I, Aakash Ranison , thought of the same thing, just like other travellers do. I thought of investing in a good and an in-budget action cam for capturing moments and taking videos, a little better than my beloved iPhone 6 (fanboy alert :P) and my DSLR. Though I would never replace my DSLR set-up for one of these, but for times carrying a DSLR with all its lenses and stuff and taking it underwater isn’t necessary and quite frankly smart, then a handy action cam is the convenient solution. It’s a very good travel gear to carry with you. But buying an action camera that would quench my thirst of owning one? Isn’t that easy now! or is it? After searching for cameras that is suitable for my travel gear for days together, looking and comparing different products to each other by their specifications, built quality, handiness and most importantly price, I finally came across the magnificent world of GoPro. With a quite large fan base around the globe and being very popular travel gear amongst travellers, GoPro was hard to miss. I felt the “Need” to buy one for myself, but which one? Which one would suit my need and still be in my budget? 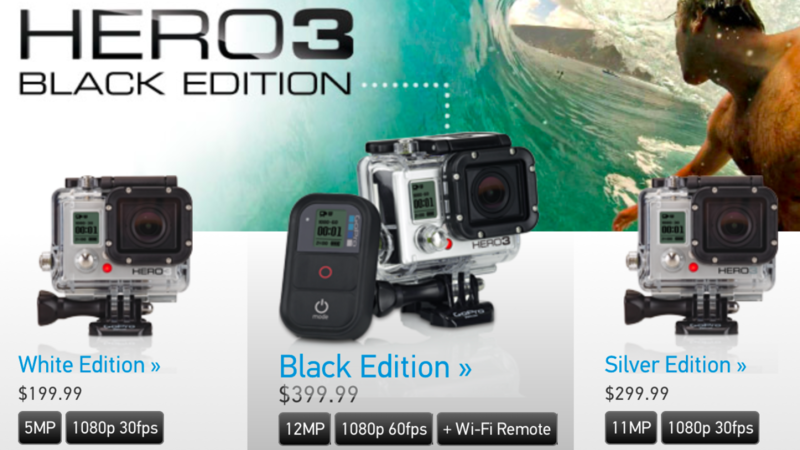 Man, there were lots of them to choose from, but finally I ended up going for the GoPro Hero3 Black Edition. It makes the perfect travel gear cam for me. 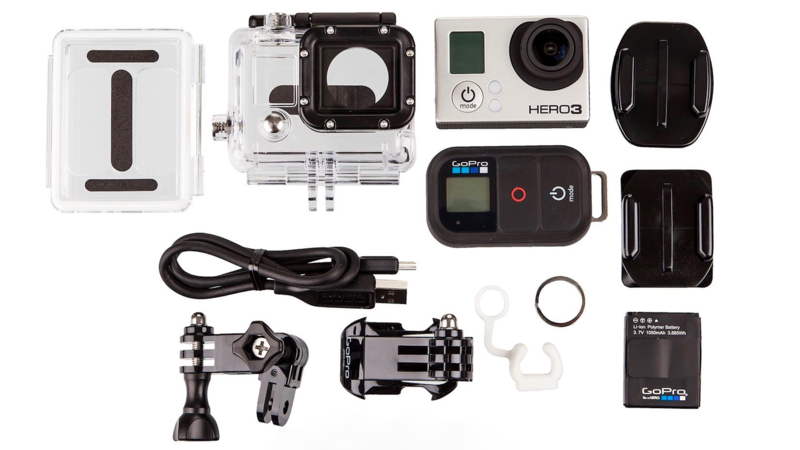 Let me just mention here in brief that the Hero3 series have total 3 models- The White, Silver and Black Edition. The 3 versions are not only varied in spec but more importantly they had different prices. The Black Edition being at the top of the range. Features: Time-Lapse recording, high-speed recording, multi-picture burst, selectable field of view. Now, getting back to business, let me tell you that one of the biggest plus point for anyone looking at the GoPro range is the pure versatility and durability of it. This tiny travel gear is waterproof that means you can literally take it anywhere, oceans, rivers, snow… you name it. And not just that but it’s waterproof up to 60m, so whether you’re snorkeling, free-diving or scuba diving you have no worries capturing the underwater world. What mainly you need in a camera is the capture quality. GoPro for me was phenomenal, I clicked lots and lots of pictures with it, be it wide angle camera shots or selfies, all turned out to be good. Yes, I actually do change the settings sometimes while taking shots, but the auto adjust feature of the gopro makes it just so damn easy to get the best out of the pictures. 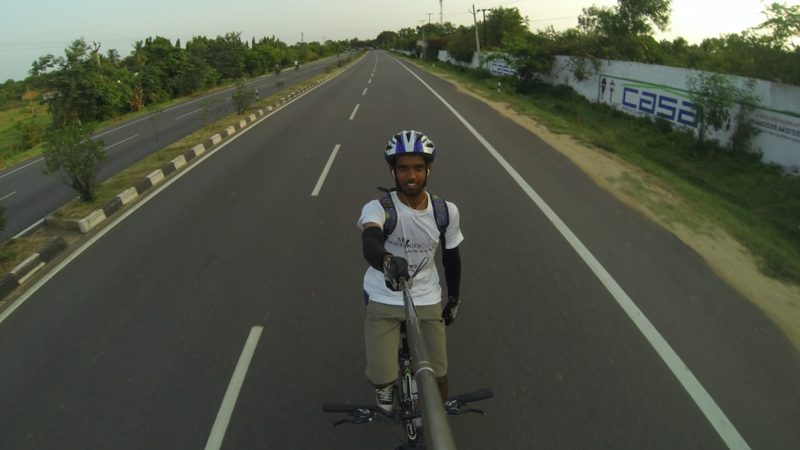 I used the GoPro while on my Jagriti Yatra and also while going to Bengaluru on a bicycle. I attached this little travel gear on my bicycle with a mount, and at the end of the cycle trip, I got an amazing video. The movie mode is something I’ve started utilizing more and I’m stoked with the results of this as well. The Hero 3 Black (travel gear) can shoot incredibly high HD footage at 4k quality. It turned out to be phenomenal but lacked in the fps. Nevertheless you can shoot in 1080p, and get awesome videos, not everyone of us have monitors or TVs to play 4K content. The wide angle lens is just incredible. It manages to capture everything! GoPro being very small and light travel gear, can be carried anywhere everywhere and used like a “point & shoot” camera. That eliminates my need of buying an additional point & shoot (travel gear) camera . It’s one of those things that’s allowed me to have fun in the water and capture images at the same time. Quality is amazing, every shot turns out to be crisp and beautiful. And last but not the least I must mention that it can capture in 4K also. 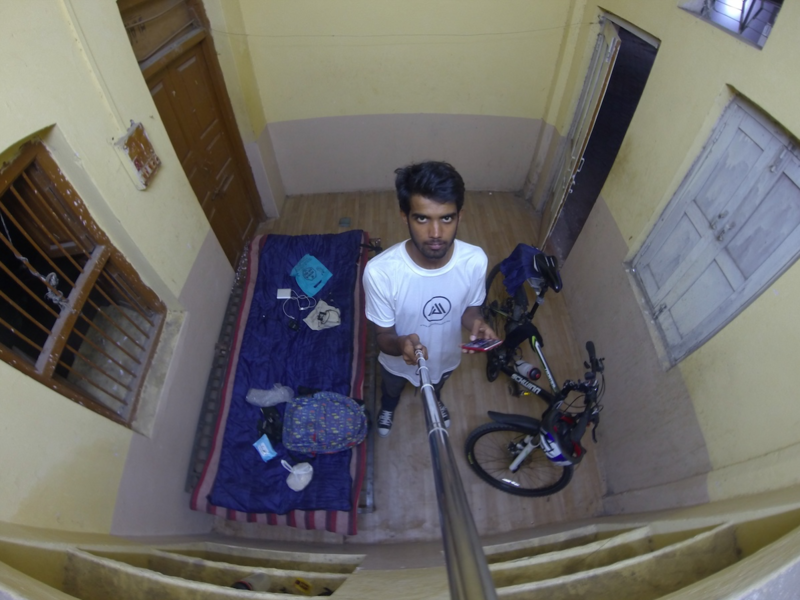 Staying in a Gurudwara one night while on my cycling trip. 35KM’s more to and it’s Hyderabad. 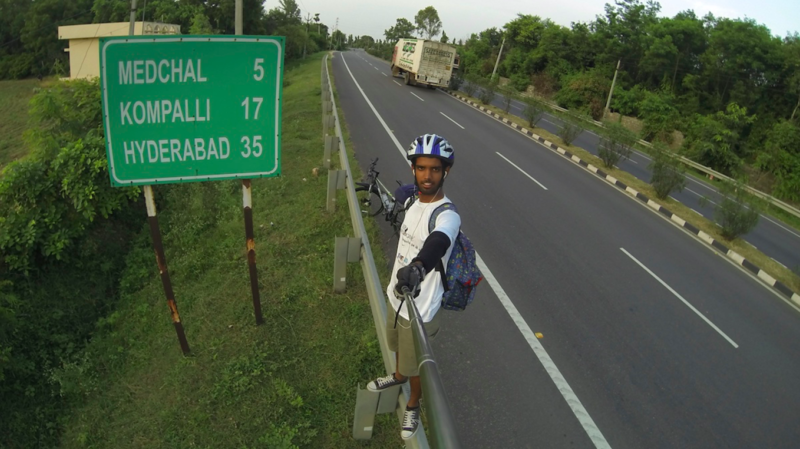 while cycling on highway towards Hyderabad. Although this small Travel gear is all good, it has a very cumbersome UI, it’s not that user friendly. You have to remember everything just to navigate through it which can be quite boring and frankly less enjoying. Also the GoPro freezes up often. I had to remove the battery and turn it back on to get it working again. The GoPro being a good travel gear cam is not “Great” and definitely not “Perfect”. It gives pictures with quite a bit noise in them in low-light conditions especially at night. If you are not a professional photographer than you can ignore this (like me :p), but if you are, than I am giving you a heads up before buying the GoPro. That being said, it will still give you great shots for your Instagram and Facebook. The last thing I want to address is the battery life. I will just say that, better buy an additional one or two battery Back-Packs as a side travel gear, it helps very much. 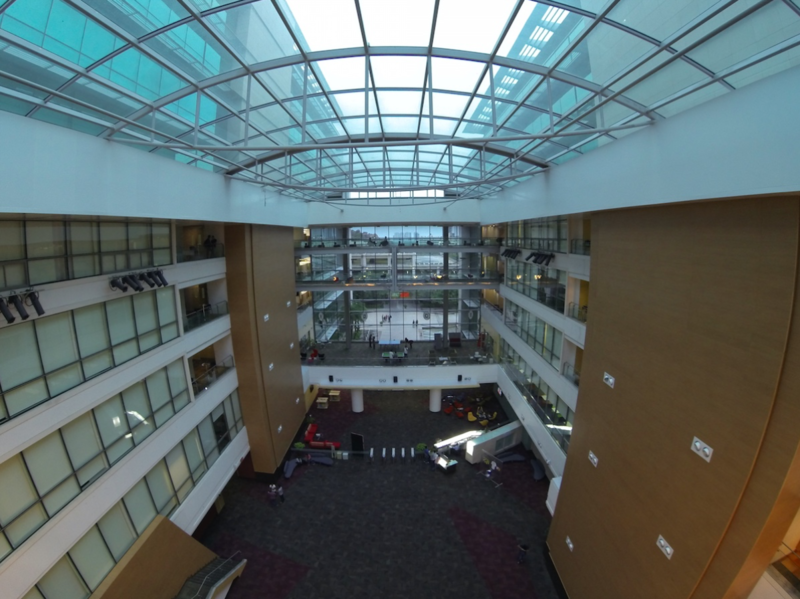 Microsoft, Hyderabad, India – Inside. 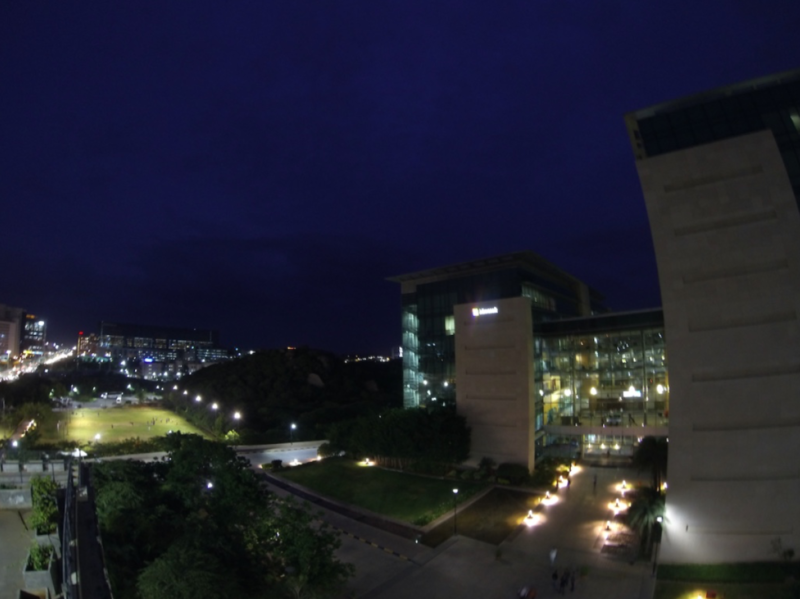 Microsoft, Hyderabad, India – Outside at Night. So, now is it worth buying this travel gear you ask? 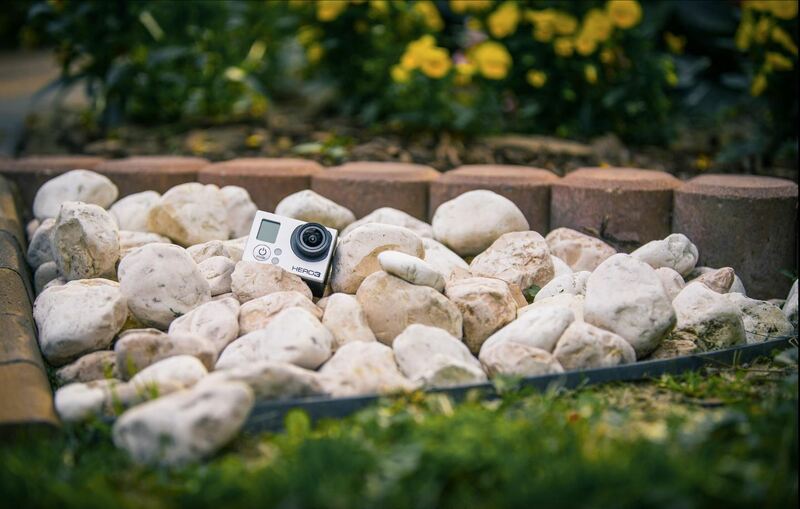 I would also like to mention that, I have used the latest GoPro – Hero4 Black, and man it’s awesome. Much much better than this one. It’s been my permanent travel gear cam since last 1 month now. Stay tuned for my review for that one as well and then decide for yourself, which one you want to go for. Also there are pretty wide range of accessories for GoPros like head mounts, bicycle mounts, mono-pods(selfie sticks), tripods etc. I will be writing about those travel gear accessories too, so look out for them. Also, I would list the must haves accessories with you on the road too. I know this has been quite long, but it’s better to give all info to you guys rather than summing it up and making it short. So, this a wrap up here, will see you guys next time with another cool travel gear review. Check my blog for other reviews too. Travel light & Keep Capturing.